1. Always keep your natural stone clean. Try to keep the surface from getting contaminated with dirt and dust. 2. Keep your natural stone flat. 3. Flatten your natural stone with a diamond plate like a DMT or ATOMA. You can also use sandpaper mounted on a flat surface like a piece of plate glass, but use another natural stone for final flattening. The surface needs to be as smooth as possible. If you do not have another natural stone to smooth your stone, use a Tomo nagura or any natural nagura you have. 4. It is very important to rinse off your natural stone very well after flattening with clean water only, as residual abrasives from your flattening source might scratch your knife if not washed away. Do not use water that has been in contact with synthetic stones. 5. When sharpening or polishing a knife or razor, use as little water as possible to create mud. Just a drop of water from your fingertip is enough for harder stones and more water on softer stones. The mud should be in the form of a paste. Always use mud when polishing or sharpening with natural stones. Using natural stones without mud will not give the best results. On very hard naturals for razors, it can be good to use with only water during the last honing. 6. Always rinse your knife or razor well with clean water only before and after sharpening. 7. Use a nagura or other natural stone to make mud on harder stones or they might scratch the soft iron (jighane) on your knife or Kamisori razors. 8. Lacquer your stone on the sides and the bottom to reinforce it. If a stone has a crack, glue it to a wooden base to prevent the crack getting wider. Cracks can also be stopped with super glue. 9. 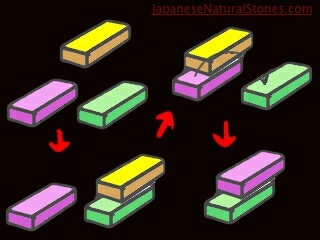 Use small soft stones finger stones on a soft iron (jigane) and harder finger stones on a hard steel (hagane). If a knife is made of mono-steel, or it is a Honyaki knife, softer stones might be better. 10. Do not expose your natural stone to freezing temperatures and do not leave it out to dry on a very cold day or night. Do not expose your natural stone to direct sunlight. Either of these extremes of cold or heat could crack your natural stone. 11. Make grooves in your nagura to help make a slurry easier and to help with any sticking problems. 12. Glue thin stones to a wooden base so they will have support and will be harder to break or crack in half. 13. If using artificial/synthetic stones to set a bevel, use 500-6000 grit stones first, then carefully rinse off any of the artificial/synthetic residue that may be on your blade with clean water before final honing on a hard Japanese natural stone with nagura. 14. The room for your final polish or honing should be clean! Dust and stone powder on stones is your enemy! For final polishing it is VERY important to keep everything very clean and use only clean water! If your water source contains a lot of minerals, distilled water or spring water may be better to use.